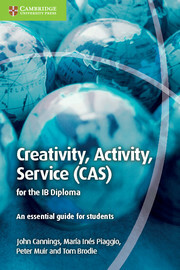 Written by a team of experienced CAS Coordinators from the three IB regions the first edition of CAS – An essential guide for students is tailored to meet the requirements for first teaching September 2015. This course book is accessible and practical for students, offering advice and guidance on how to select a suitable CAS activity and how to approach the task: from planning and time management to what makes a successful and positive CAS experience. This resource is also helpful for CAS Coordinators and those involved in planning student CAS projects in their school. 10 CAS and the IB learner profile.